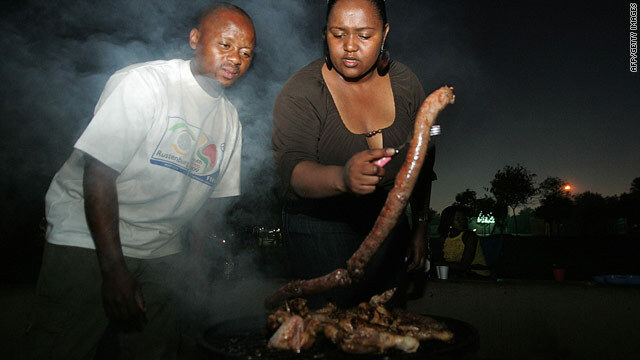 South Africans grill food on a braai -- the Afrikaans for "barbecue" -- in Soweto in 2009. South Africans love to cook lots of meat at outdoor barbecues known as "braais"
Popular foods include spicy sausages called "boerewors," lamb chops and "pap"
Johannesburg, South Africa (CNN) -- Most football fans, if they are not already, will have to become rabid carnivores during their visit to South Africa for the World Cup. South Africans like their meat and they like to cook and eat it out in the open, under the clear blue skies. If you are invited to a "braai" or a "chisa nyama" you are basically going to a barbeque. There are variations on what you will be offered, depending on who is hosting you and where you are. In general, you will find yourself eating spicy sausages called "boerewors," lamb chops and some "pap," which looks like mashed potato but is maize meal. Pap is often served with delicious tomato gravy. Of course, the food is washed down with copious amounts of South African beer. Another meat staple in South Africa is "biltong" -- which is a bit like beef jerky, but tastes much better. Biltong is an excellent snack to nibble on as you journey through the country. Try the kudu or ostrich biltong, or just stick to good old beef. Either way, you can get addicted to the stuff. It is very more-ish. The key to eating well in South Africa, or anywhere in the world, is simple: stick to local, fresh dishes. So I would not suggest that English football fans order grilled sole in Rustenburg, which is nowhere near the sea. However, the French and Danish football fans have it lucky -- their teams are based in Knynsa, on the Garden Route. So local oysters and fresh fish, such as the succulent Kabeljou, should be on their menus. That said, except for Cape Town and the surrounding areas in the winelands which have sophisticated restaurant scene, most South African food is simple and not fancy. So, stick to the basics at restaurants and a huge T-bone or a juicy fillet steak will not disappoint you. The prices might knock your socks off -- choice pieces of meat are much cheaper than in most capital cities. If you are looking for a quick meal on the way to a football match, munch on decent burgers from "Steers" or delicious spicy chicken from "Nandos." You should be able to find at least one of these eateries in most South African towns. If you prefer a good-sized trendy sandwich packed with rocket leaves and other posh nosh, try the "Lulu" chain. You can also get excellent takeaway coffee from the distinctive, red-and-white decorated "Vida e Caffe." As far as fast-food joints go, all of these offer great food. South African farms export fresh fruit and vegetables to Europe, so do not worry about getting sick from dirty germs that plague some travelers in developing countries. Often, the food in South Africa is fresher than the stuff you buy in supermarkets in London or elsewhere on the continent. During the winter here in the Southern Hemisphere, you will find loads of avocados on the shelves. Stock up, because I think nothing tastes as delicious as in-season avos from the Limpopo region of the country. Also, "mielies" are what the rest of the world call "corn on the cob." South African mielies are sweet and crunchy, so look out for them at a braai or when you go food shopping. Don't be a nervous eater when traveling to South Africa, it would be a shame to miss out on the cheap, fresh produce available. Expect a warm welcome - but cold weather!